Long time Android users have probably noticed that finding quality apps in the Google Play store has been growing increasingly difficult as of late, especially now that over 700,000 of them have already been published. Thankfully, there are developers out there dedicated to sorting things out, and we mean that quite literally. Introducing AppDisco – a handy little piece of software that helps you discover new games and applications based on multiple criteria. You can find new apps by browsing through the number of categories that are listed, or just look for alternatives to the ones that you currently have installed on your Android device. 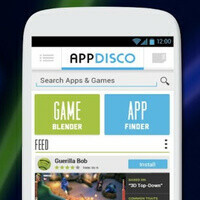 But when it comes to finding games using AppDisco, things get a whole lot more interesting. The application comes with a feature called Game Blender, which allows the user to choose the traits they demand in a came. For example, one can pick a 3D, first-person shooter with realistic graphics and touch controls from the menu, and a number of quality video games that match these specific criteria will be returned. Sounds pretty cool, doesn't it? Well, there's a lot more you can do with AppDisco for Android, so feel free to check it out in action in the video embedded below. The application is available for download from the Google Play store. the first to try this exciting, new Beta. Please give feedback, as it will only help us grow. hundreds of unique traits, mobile app discovery has never been easier or more fun! It’s your choice! Decide what you want to be notified about and let the fun come to you! popularity. Make AppDisco your own personal app store. Multiplayer.” It’s like a Pandora for mobile games. Save your searches and make them playlists. actual likes, not generic categories. Share with your Facebook Friends or Twitter Followers, Uninstall, Move2sd, and more! Does anybody know how this compares to AppDJ?